There's really not much new here. 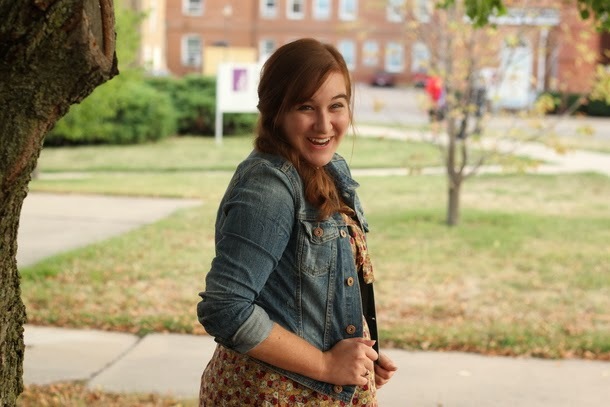 Between this dress, my trusted white loafers, and my denim jacket (which I'll admit is probably much more common in my every day dress than I let on just in outfit photos), this outfit is full of pieces that have appeared here time and time again. Yet, with leaves on the ground and the seasons changing, the outfit suddenly feels new. Though it's not as cool as I'd like it be, it's finally fall and I have no shame in being one of those bloggers who constantly goes on and on about how great that is. I love fall, and I don't care who knows it. Stop me if I'd said this before (let's face it, I probably have), but I never got to experience the season in all its glory until I moved to the Midwest. The weather doesn't change too drastically back home in California, and it definitely doesn't have that same feeling that exists out here. I almost feel like a fraud for all of those "falls" I spent bundled up in sweaters and drinking warm coffee drinks. I still have no idea where I'm going to end up come May when I graduate, but I'll definitely miss the small-town Midwest fall I've come to love. Things have still been busy, but it's probably my fault for think I could have sleep, school, work, AND a social life. It's really been hitting me lately that this is my last year here, so I've been trying to spend more time with my friends. But I guess when complaining about the new season of How I Met Your Mother and following it up with episodes of Firefly is involved, I can't really say no to that. The moment someone asks me to sit in a coffee shop (again, I mean. I might have just done this last week.) for hours, all bets of being productive are off. There is one new thing in this outfit, and it's pretty wonderful. My oldest brother and sister-in-law gave me a very belated birthday present (only two months late, no big deal) of a $25 Modcloth gift card. There may have also been some booze involved, but that's besides the point. What's a girl to do but a buy an ampersand bracelet? She buys that ampersand bracelet, that's what. The dress is so cute! Lovely outfit! 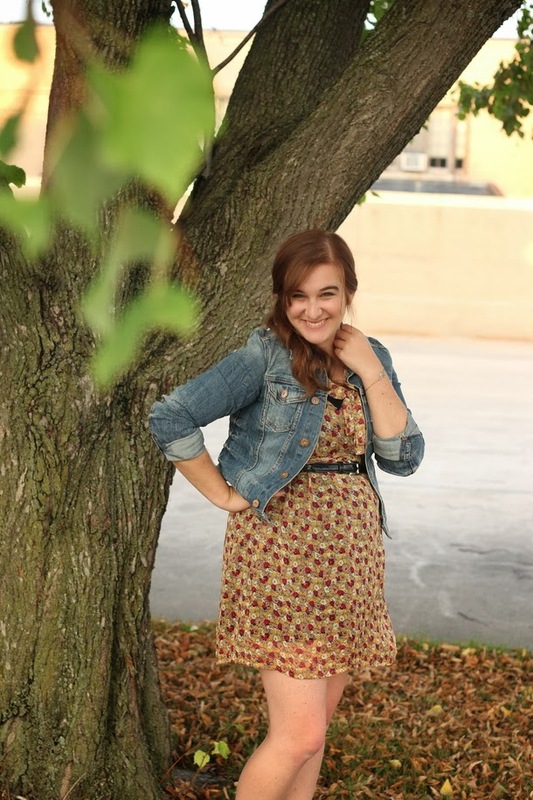 There's absolutely no shame in talking about how much you love fall over and over again. I know I'll be doing the exact same thing on my blog, haha. Blogger problems. Girl I feel ya, I love fall too. There is something magical about the transition seasons of spring and fall that make me feel excited! Love this outfit! The colors are so pretty- especially with those gorgeous leaves in the background! I am also one of those bloggers. But, to be fair, I do this with every season but winter. I just love busting out clothes I haven't worn in a while! Fall is definitely my favorite season too! Unfortunately we only experience two weathers where I live: Winter and summer haha. 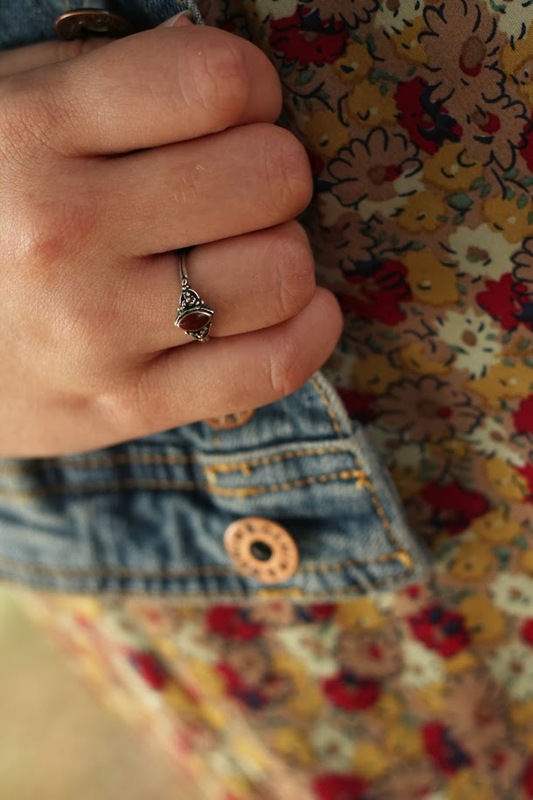 I love your look - the color of your dress is perfect for fall and it looks amazing with your denim jacket. 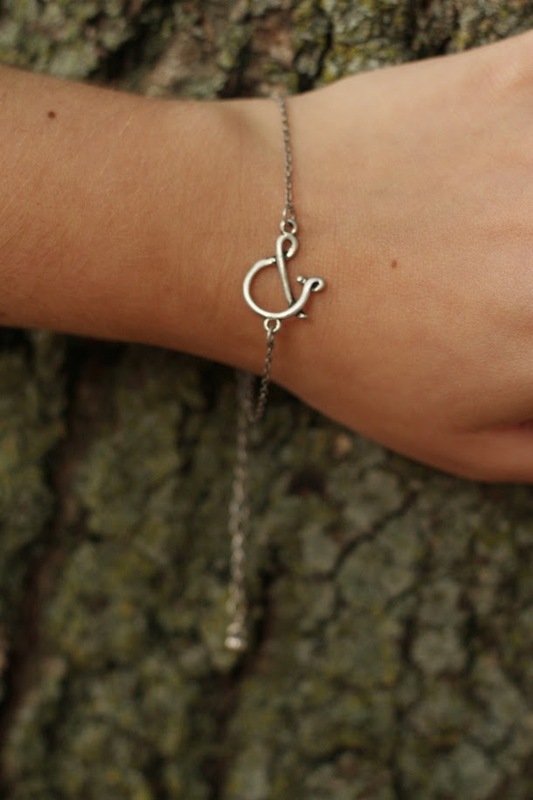 And cute ampersand bracelet! Your dress is so cute! The colors are so autumn! Love it! I can understand wanting to hang out with your friends every change you get since it's your last year. While this isn't "good" advice, I would say hang out with your friends over being productive because now that I'm out of college, I wish I'd hung out with my friends more. Don't let your grades slip, but after school is over grades don't matter anymore. Memories do. Have fun! I absolutely love fall and don't care who knows it either! The fall season is definitely better up north though. It hardly lasts here. It comes very late and quickly turns to a weirdly warm winter. The leaves only change for a week or so. It's dumb and I want to live farther north! 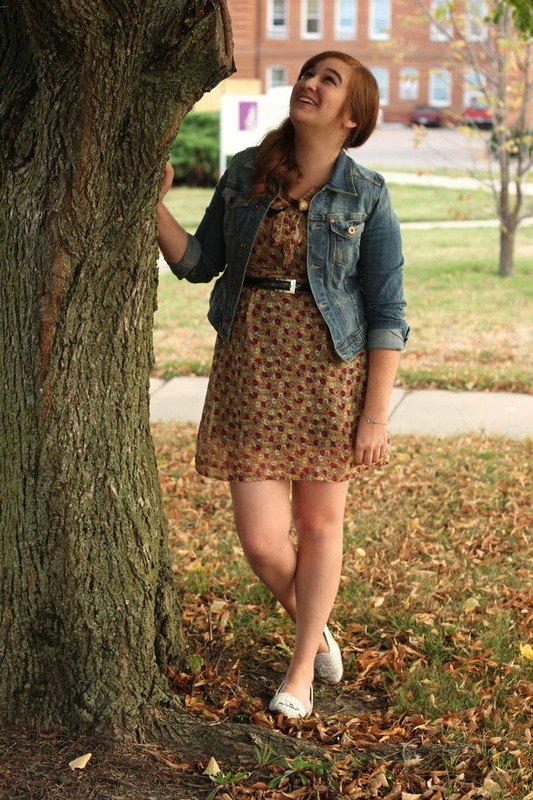 But anyway, this outfit is so cute and perfect for fall. I love your jean jacket! That ampersand bracelet is the cutest. 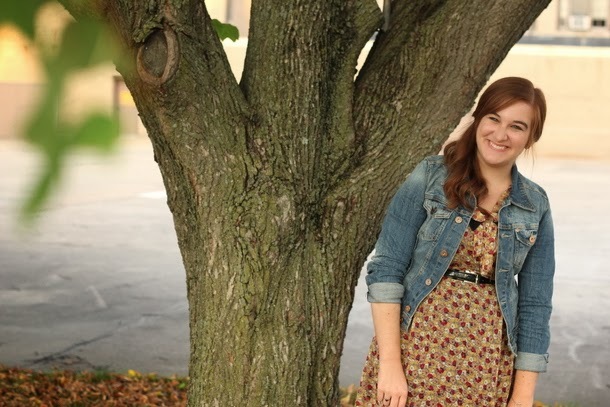 Ooooh, this fall outfit is gorgeous Elana! Haha, and true, fall in California is practically nothing, huh? Plus, who could turn down an ampersand bracelet? Its awesome! You look so cute! Love your dress! Eeee, and that bracelet is awesome! Adorable! Your dress is lovely and it kinda matches the leaves! Love your loafers too, they look so comfortable! Love your dress! The color scheme and print are perfect for fall. It looks great paired with a jean jacket as well. This is the first time I've been on your site and I love this post! Great color palette and photos! I love fall too, its probably the most I post outdoor photos and trips! Looking forward to more posts by you! What a great set of photos, love everything about this outfit! 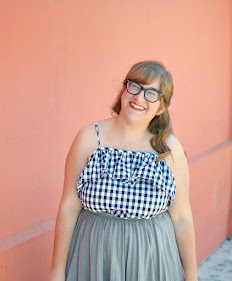 I just found your blog and I love all of your outfits! I wish we had a slower transition from summer to fall so I could wear cute outfits like this, but we went from hot and sunny 80s to cold and rainy 50s overnight. I love this look though and totally wish I could be wearing it right now!